White House Says Conway Acted 'Inadvertently' When She Plugged Ivanka's Products : The Two-Way The senior adviser to the president didn't mean any harm when she appeared to violate ethics rules in an appearance on Fox and Friends last month, the Trump administration says. Presidential counselor Kellyanne Conway answers questions during a television interview in the White House last month. White House adviser Kellyanne Conway acted "inadvertently" when she urged shoppers to buy Ivanka Trump's products on Fox and Friends last month and won't make the same mistake again, the Trump administration says. "It is noted that Ms. Conway made the statement in question in a light, off-hand manner while attempting to stand up for a person she believed had been unfairly treated and did so without nefarious motive or intent to benefit personally," wrote Stefan C. Passantino, deputy counsel to the president, compliance and ethics. 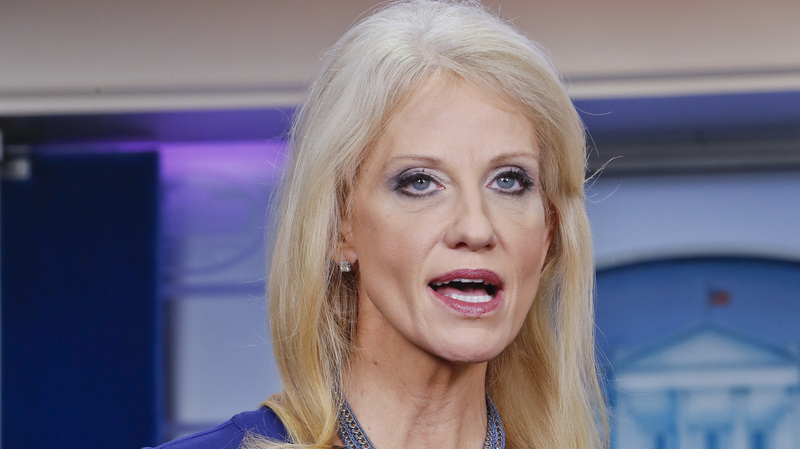 Passantino made the remarks in a letter to Walter M. Shaub Jr., director of the U.S. Office of Government Ethics, which had recommended possible disciplinary action against Conway. When she appeared on the Fox show on Feb. 9, Conway criticized the decision by Nordstrom to drop Ivanka Trump's line of fashion products. The retailer has said the products weren't selling well. "Go buy Ivanka's stuff is what I would tell you. I hate shopping, and I'm gonna go get some on myself today," Conway said. White House press secretary Sean Spicer said shortly afterward that Conway had been "counseled" over her remarks. That a White House employee would use her platform to encourage shoppers to buy products sold by a member of the president's family was widely criticized as a violation of ethics regulations. "That is absolutely wrong, wrong, wrong. It is over the top," said Jason Chaffetz, the Republican chairman of the House Oversight Committee. He and ranking minority member Elijah Cummings of Maryland later sent a letter to the White House calling for an investigation into the incident. What happens next is not clear. The OGE said it is reviewing the White House letter and had no immediate response. Cummings expressed disappointment in the White House's response. "It is a very bad sign that the President chose not to discipline Ms. Conway for blatantly violating the law. Other federal employees would likely be suspended for engaging in this conduct, and White House officials should not be held to a different standard. I hope that the President reconsiders his decision and that he and his staff will take their ethical obligations more seriously." "An internal walk through of rules that she broke is in no way an adequate reaction to the product endorsements made from the Presidential stage by Kellyanne Conway. Her blatant sales pitch for Ivanka Trump's fashion line is a violation of ethics laws and publicly demonstrates how willing the Trump regime is to manipulate the government apparatus to advance its private business interests. We should have more than assurances that she is 'highly unlikely to do this again,' and instead should have an administration that is eager to uphold ethics laws, and hold those who break them accountable with real consequences." Passantino said in his letter that he had met with Conway to advise her that her comments violated ethics rules. "Ms. Conway has acknowledged her understanding of the Standards and has reiterated her commitment to abiding by them in the future," he said.